DSL Web Hosting 2.8 free download. DSL Web hosting is a useful and free dynamic dns client application that includes a built-in web hosting, let you run your own web hosting from home on DSL connection with Dynamic IP address, any Internet users could type in your domain and surf on your DSL Web hosting. 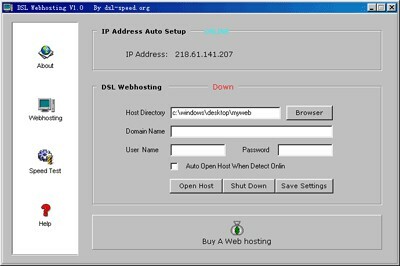 Auto detect real DSL Dynamic IP address. Auto run hosting when detect online. iP is a FREE revolutionary 2D Avatar Visual Chat software application. SmE Fast Users Online is a free and useful tool that allows you to run your own Online users hosting service. DynSite: Dynamic DNS Site Configure is a useful program that can upload dynamic ip address information to DNS SERVICE PROVIDER to Run service (HTTP SERVER/ FTP Server /POP Server / SMTP Server etc.